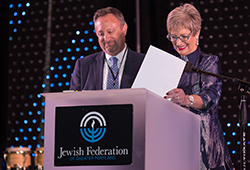 Michael and Kathy believe that philanthropy is the backbone of Jewish cultural and religious survival so committing to make a legacy gift in support of the Jewish Federation of Greater Portland through their OJCF donor advised fund just made sense. "It is critically important that we pay forward our Jewish heritage by funding institutions and groups that will preserve the values we cherish," shares Kathy. The LIFE & LEGACY program triggered discussions between them regarding how to best accomplish their philanthropic goals. "Nothing is more important to us than the preservation and enhancement of a vibrant Jewish community in Portland," says Michael. "Kathy and I will continue to work with OJCF, the Jewish Federation of Greater Portland and other organizations to find ways to make sure that Portland's Jewish community continues to thrive for future generations."